In August 2016, we visited Ken Wright Cellars’ tasting room in Carlton, Oregon for the second time. We stayed at their Carlton Lofts which is very beautiful, but pricey. It’s worth noting that Ken Wright doesn’t discount anyone for tastings – so be prepared to pay the full amount no matter if you’re a blogger, an industry representative, a somm or a drinker. It’s interesting that during this second tasting, I came away with a bottle from the same Savoya Vineyard as I’d purchased in 2013 (I got the 2008 version in 2013). On the eyes, this 2013 is completely translucent garnet with aromas of cherry, mushroom, earth. The palate is dry with feathery tannins and flavours of more cherry, glove, mushroom and loam. WSET Very Good – elegant, subtle, clean. Their wines are lovely, but as I mentioned before, I do wish they’d figure out a new cork for their works of art. The plastic is ugly and difficult to remove – an odd choice for such an expensive bottle. If they’re truly concerned about oxygen ingress, they could choose a stelvin cap or even a glass stopper. 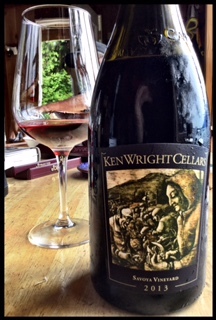 This entry was posted in Oregon, Pinot Noir, RED and tagged 12.5% abv, Ken Wright Cellars, oregon, pinot noir, red wine, Savoya Vineyard, Willamette Valley, Yamhill-Carlton AVA. Bookmark the permalink. Love your work my friend! And I agree… at $85US, you’d think tech is out there to be past the plastic cork…??? RIGHT?! It’s just always such a shock to me to open up a Ken Wright and have a fight with a plastic cork! Go Stratera, go!